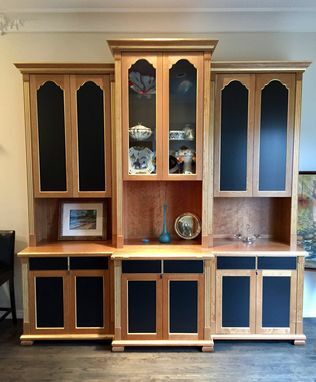 Cherrywood, black lacquer and gilded chinoiserie breakfront cabinet. This piece is traditionally styled with chinoiserie accents and detailed features. A fold out middle section and plenty of storage are just the start of this cabinets beautiful utility.